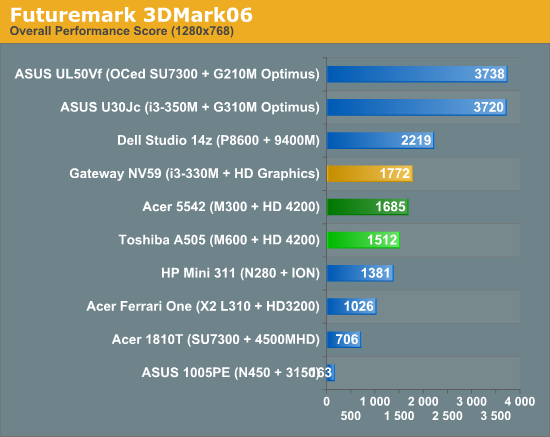 While we were pleasantly surprised by the Turion II Ultra M600 that Toshiba chose to equip the A505D-S6987 with, the Mobility Radeon HD 4200 hanging off the RS880M Northbridge is a largely known quantity at this point. Little more than a DirectX 10.1 refresh of the venerable Radeon HD 3200 part—right down to the 40 shaders and 500 MHz core clock—expectations are low. At this point it's worth bringing up two things Toshiba neglected to equip this Radeon with, though: a dedicated frame buffer and membership in AMD's mobile driver program. 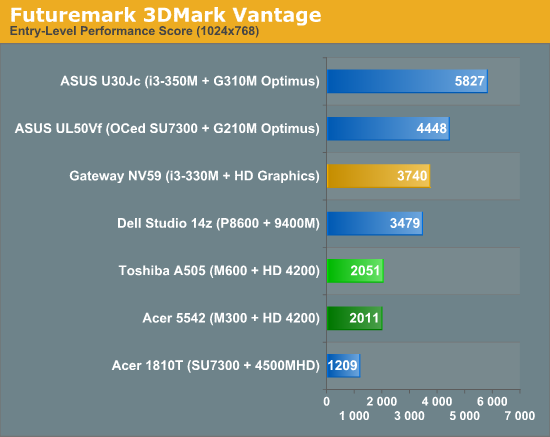 The first is splitting hairs, but the last is an unkind cut that wound up causing us some trouble during benchmarking. 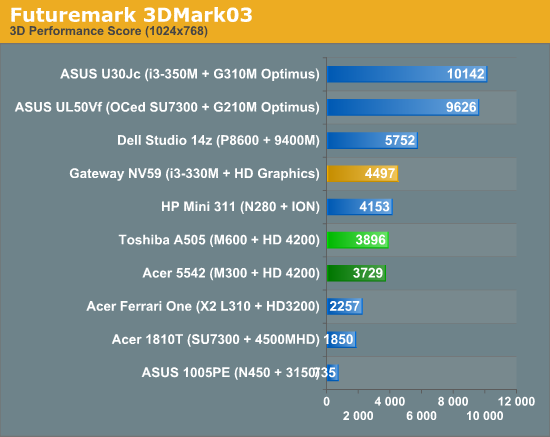 It's almost cruel to run a battery of benchmarks like these on the HD 4200, and while the notebook remained relatively cool it wouldn't have been surprising to see the poor chip just burst into flames. 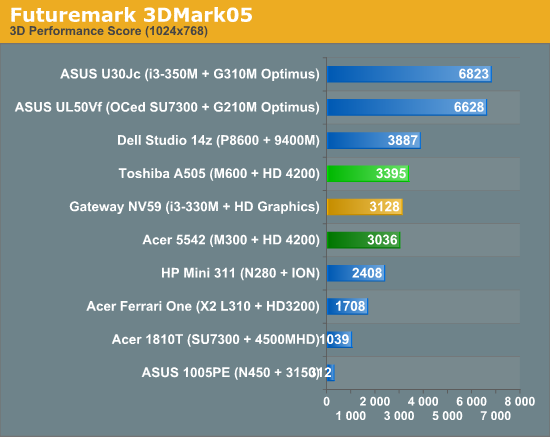 Scores were high enough, and the faster processor in the A505D allowed the HD 4200 to pull a little more weight than usual, but it still struggles to compete with NVIDIA's GeForce 9400M, and the Mobility Radeon HD 4330 proves just how much an extra 40 shaders and dedicated video memory can help. When the Radeon HD 3200 dropped it was a very healthy jump in integrated graphics performance, but this DirectX-10.1-and-otherwise-name-only refresh is in dire need of an update. An no, we're not talking about the HD 4250 or HD 4270; we'll likely have to wait for Fusion to see the sort of IGP update we're looking for from AMD.